Go hard, stay strong and improve your performance with SKINS Essentials Mens Active Compression Socks. An essential part of the SKINS collection, get your blood racing and more oxygen to your calf muscles thanks to the anatomically applied engineered gradient compression fit. By improving circulation, this reduces blood lactate build-up which in turn minimises muscle fatigue and the risk of injury. 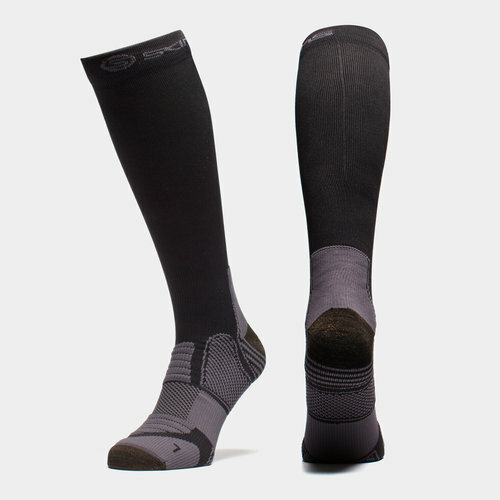 It's not all about the calf as the foot itself has been designed with special anti-chafing yarns in the heel and toe to reduce heat, moisture, friction and blister development which are a common annoyance. Not done there, SKINS have also included an Arch Wrap support to reduce the strain and impact on the sole of the foot while SKINS Copper Technology acts as an anti-fungal to prevent foot odours. A practical black design is given pewter coloured detailing as the SKINS brand wraps around the top of the calf.